The above info came from atomofish, and was edited by yours truly (contact me). The image came from Anime e Oltre. Daigunder is an anime set in a future where talking robots are common place. 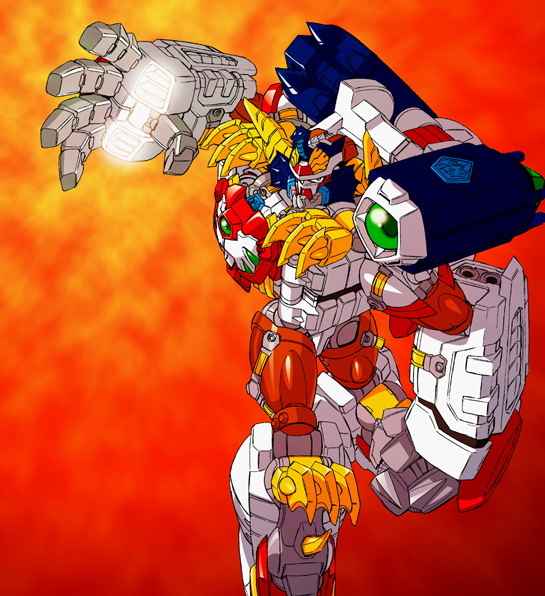 The show focuses on Akira Akenbo, a young boy who is competing in a robot tournament where many of the robots are capable of transforming into animal forms. Akira wants to win the ultimate prize, the Titan Belt, with the help of his group of robots, all of which are capable of forming into the robot Daigunder. Daigunder is the creation of Akira's father, Professor Hajime Akebono. Together with a girl named Heruka, they compete under the name of Team Akira. However, Team Akira faces opposition from not only their competition, but a robot named Ginzan who is under the control of the evil Professor Maelstrom. Note: Daigunder returned to the air on Toon Disney this past June, 2006. It began airing at 10 PM every Sunday night and has since moved to 10:30 PM every Sunday night. Recently, Toon Disney's schedule confirmed that they will air past episode 20 this time around. Previously they did not air past episode 20. It is believed they will air all 39 episodes this time around.